Barbara’s quilt ‘For the Love of Lace’, incorporates her love of crazy patchwork, lace and embroidery. She talks about coming up with the design of the quilt and making the quilt; including links to her family by incorporating family tree and symbols. Barbara is self-taught, doing her first quilting in her teens; she explains how she’s developed and the joy it gives her to pass on her skills to others. She also talks about the therapeutic benefits of quilting and the social aspects of her quilting life. Amanda Davidge [AD]: This is an interview with Barbara Dodds and Amanda Davidge, ID number TQ 2015 06, we’re in Lostwithiel, Cornwall, and the date is the 26th of November, 2015. So, Barbara, we have this lovely quilt in front of us. Could you tell me something about the quilt? 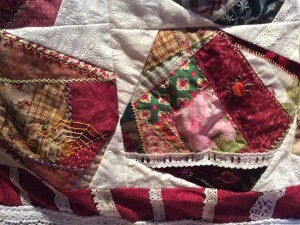 Barbara Dodds [BD]: Well, the quilt is basically a crazy patchwork design, which you can use any type of fabrics. It was very popular in the Victorian times. 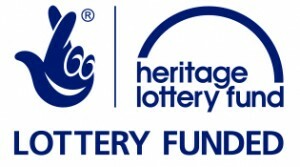 I first saw this design being used on the TV. I liked it because it meant that you could use up all your scraps of fabric, if necessary, you didn’t have to have a structured pattern, and… you didn’t have to sew the quarter inch seam. The seam could be… The seam could be any size you want. AD: Okay, we just stopped for a minute because the phone rang so, Barbara, yes, can you please carry on telling me about your quilt? BD: Yes. You can buy a template to do the middle piece, but I never, I never bothered with that because I think it’s, it’s better that it’s… each block is individual rather than being the same. So I used in my quilt an old scarf which was heavily embroidered, sort of velvety sort of texture. I’ve used curtain material, old shirts, bits of dresses that I had… Shawls that I’ve used in the past. And it’s very quick to make up a block. You have a, a foundation square… You decide on the size that you want. You have a foundation square. You sew on your middle part of your fabric. That could be any shape you like, I usually start it off with a square. And then it depended on how I laid the fabric over the top. And you lay the fabric in a way a bit like a log cabin, so it goes round and round. And I liked to do as much as possible, a light row and then a dark row. You can see in some of the, the pa… er blocks here. And they, they grow really, really fast, and they’re very interesting to do. And then I sort of thought, ‘Well I’ll, I’ll buy a couple of books on crazy patchwork.’ And when I saw one particular page it had all the seams were embroidered and I thought, ‘Oh, that looks really, really nice.’ I did do a couple on my machine, and I thought, ‘They’re really… They look nice,’ but I didn’t think they looked as nice as the hand embroidered seams. So I started incorporating into the quilt lace and ribbon, and just sort of bits of anything really I sort of saw that I liked. And then when I sort of saw this embroidery I thought, ‘I, I need to do some embroidery on the seams.’ So I bought a couple of books on embroidery and basically self-taught myself. And I did…I started doing the seams, which I found very therapeutic, and really, really enjoyed mixing up some of the stitches with other stitches just to sort of see what they looked like whereas you can have a, a straight stitch, or a fe-feather stitch is my favourite. And then you can put in some French knots and make a flower! And it was just really, really interesting to do. Very time-consuming to do the, to do the actual seams. That took me much longer to do than actually doing the whole quilt. While I was doing the blocks one day I thought I’d use up some really small scraps, and I decided to do one that was like this one here which… which is actually two triangles joined together, and the crazy patchwork has been done on that. So it’s much smaller pieces, and you can use up really tiny, tiny scraps of fabric, and then join them together. A… But that was that took a lot of work to do, and especially because you’ve got far more fabrics in there. Because they’re smaller pieces you have a lot more seams to do. And I did actually at one point think, ‘Why did I start this?’ because the, the… it took forever to do all the seams, but I’m really pleased I did persevere. And while I was doing the quilt, gradually pass it on to my family, and I thought, ‘Well, in future generations they won’t know anything about this quilt.’ So I put in, I started to put in things that actually related to, to the family. My husband’s Scottish so I embroidered a thistle. Because I was born in England I put in a red rose. And I thought it impor… important because my children never met my mother, um ’cause she died when I was in my early twenties, I didn’t want them to forget her heritage, so I appliqued a shamrock in there. And then I also designed one particular block, which is a, a family tree, and it has our chil… our… my husband and myself, and the dates that we were born and when we were married, and then it has my children’s photographs in the next row with their partners and husbands, and their dates and then it’s, it’s got…I ha… do have two grandsons so they’re in it as well. But there is space to put more, [laughs] if um, if my other two children have ha-have children. BD: but to hear the judges’ comments was nice. And because of my quilt…I, I do ha… I already had an adult education certificate, so from having done this quilt I have actually taught a workshop on crazy patchwork, [background noise] and that led to also doing a couple of workshops on hand embroidery. And it’s, it’s nice just to pass on the tips and the skills I’ve, I’ve learnt, [background noise] which, as, as I say, I’ve, I’ve all been self-taught with all my sewing, including the patchwork and the embroidery, and I’ve learnt it… particular on the blanket stitch of a, a trick that you can do by putting two little dots on your fingers so that you then have equal space. When you are doing your blanket stitch, you put it on the edge of the seam and you c… you then have it…you just move it along, and you know then that you’ve got an even seam. Um. So that was a, a, a tip I was able to pass on which people were quite surprised about. And plus also when you start to, to do embroidery and you use the embroidery floss, a lot of people didn’t know the best way of starting off with that, so I was able to pass on a, a couple of tricks on that, which I think people found interesting how to start it off so you don’t have a knot at the back, and how you actually pick out an easy way of picking out your threads, because a lot of people will just open the, the s… the thread, the skein, and then just cut off a piece. But you don’t do that. You actually cut it all to a certain length. And if you make a hole with a punch in, in a piece of card, then you can write the number of the, the shade, and you put it through there you just pull one thread out. And you, you put it through the needle; you fold it in half and you… if you lick the needle and not the thread that’s another tip, because sometimes when you lick the thread you’re making it expand. So you lick the, the eye of the needle and you put the, the thread through. It’s much easier that way. So your loop goes through the eye of the needle and you pull that down. And then when you do you first stitch, you do a tiny, tiny, little stitch, and you put the needle through the loop, and then you don’t have a knot on the back and then you start to embroider. A lot of people didn’t know that. BD: So that’s, that’s a, an interesting little thing. I, and I do, I do pass on… Whenever I, I find a, a trick from something I’ve, I’ve done, in the embroidery or in, in the quilting, I always pass it on, because um it’s nice to share, [Interruption] nice to share these things. So I, I love my quilt. It, It… I know which one of my daughters it’s going to. It’s going to my youngest daughter, because she’s now also into quilting and she really enjoys it. My elder daughter is into sewing, but not quilting yet; she hasn’t yet found her niche. But I will make her a quilt and I will make my son a quilt. But I have an idea for my next quilt, and that is using vintage linens and tablecloths. And I haven’t quite decided yet how I will edge them. I know they’re going to be hexagons, and I haven’t quite decided if I’m going to do a back-to-front hexagon, which is where you have your hexagon shape and then you have another piece of fabric, also a hexagon shape which is much larger, and you turn over the edges over to the front, not to the back as you would normally do in English paper piecing. You p… you bring it to the front. And of course it would be much larger than you would use for English paper piecing. And you bring it to the front. And then you can either just slip stitch [background noise] or you can embroider the seams and as I’m so into embroidery it’ll probably embroidered. [background noise] or to do what they call, I don’t know if anyone’s ever heard of it, is Japanese paper folding, fabric folding, sorry. And that would be you would have a hexagon, and on the back you would have a circle of fabric, [noise] which is larger than your hexagon, and you have Bondaweb on it. So then what you do is you fold it over onto the front of your hexagon, and that’s called Japanese fabric folding, and then you can either sew or embroider the edges, so I haven’t quite decided yet about that. But I, I like quilting because it’s creative. I like being creative. I don’t like just to sit of an evening and do nothing. And you can embroider the seams. You know it’s not making a noise so you’re not disturbing anybody else. Mm. It’s relaxing and it’s therapeutic. I have been quite ill at times when I’ve been doing the, the quilt, and it has helped take my… the mind off my pain, and ea-each stitch I’ve done with love. And I realised that all the different embroidery stitches I’ve done, my daughter is not going to know the name of them because she’s not into embroidery and future generations are not going to know the name of them, so I decided to make a stitch journal, which I did in fabric. And most of the pages, well, all of the pa… the paper pa… pages, fabric pages, have got the stitches on that I’ve used in the quilt with the name, and then there’s also a pocket inside which I will do other stitches that are in the quilt and put in that. And then when I’m no longer around, [microphone noise] it will ha… my, my daughter will know, and future generations will know, what’s the name of each of the stitches that are in the quilt. When I was starting on the back, I wanted something quite different. And although you never see the back, I wanted it to be quite different, so I decided instead of just having ordinary material on the back I would put a, a fleece blanket. So I found what they call a vintage rose blanket which I put on the back, which is quite handy because sometimes when you put cotton on the back and you put it on your bed it tends to slip, whereas with this sort of fleecy blanket it doesn’t. So I, I really liked that and I’m going to put a label, I’m going to make some labels to put on the back to say who I am. And actually in, in one of the seams in, in one of the blocks I’ve put all our initials as the embroidery all the way ’round. I can’t remember which block it is but it’s it is on there. And when I was looking through the the, the books that I had on crazy patchwork, it was mentioning about in the Victorian times they often put in insects. So that was the first bit of embroidery I did; I fo… I did a little spider. And I was quite pleased with it. I think I’ve got the wrong number of legs on it but it doesn’t matter. Mm. [noise] And I was quite pleased with it so I made a bigger spider. And then I thought, ‘Well they really need a spider’s web,’ so I put a, a spider’s web on it as well, so it, it relates back to, to past generations with that. But on, on the back I will put a label to say who made it and how many pieces are in it. [noise] And I did, I did count up how many pieces of, of fabric I’ve got in the, in the quilt, and there’s about 680 pieces altogether, although there’s only 36 blocks because it’s not a quilt that goes all the way over the bed, it just lays on the top. There are s… including all the pieces of lace and all the vintage lace that goes around it altogether, there’s 680 pieces, and there’s 380 seams that are embroidered. So I will put all of that on the back because I think people might find that interesting. But when I was doing the back, I wanted it to, to have some relation to the front, [noise] and I wasn’t quite sure what I was going to do. And then I, because I’m into crazy patchwork, I just absolutely love it, I decided to make some crazy patchwork ribbon, so I just tore up strips of curtain. And all the little pieces that I had left over from the front, ’cause I never throw anything away, as most sewers don’t either, [noise] and so I sewed those on to this backing of curtain. And then all the seams are embroidered down so there’s no frayed edge. And there’s little bits of lace in there as well that, that ha… that’s been on the front. And I also embroidered, somewhere on one of these lace, lacy ribbons, I embroidered the date of 2015, ’cause that’s when it was finished [noise]. AD: Wh-When did you start your quilt and where did you do most of your quilting? BD: …it’s just very interesting. AD: When you saw it at the Festival of Quilts, what did you… what were your feelings? BD: Um, it felt quite strange actually to see something that you’ve made hanging up for so many people to see, and it was a bit… I was a bit nervous before I first went and saw it because, you might like something but not [laughs] everybody else does, and it may not be everybody else’s taste. But when I first went to see it I, I felt very proud of the fact that it was hanging up there and they, they thought it good enough to hang up in their exhibition, which I thank them for. And then, while I was looking at it, two ladies came along and they were looking at it and they said, ‘Aw, we had never thought of doing that with our old linens that we’ve got in the drawer, so we could, we could do something like that.’ So it’s nice to know that you’ve inspired some other people to do things and, and lots of people that I’ve spoken to about crazy patchwork haven’t known how to do it. You do it by a stitch and flip method, because you lay your fabric face right sides facing and you sew the seams and you flip them over and, and carry on that way. So a lot of people would look at it and not know how it was done, so it’s nice to, to show that and, and explain that. And I’ve also, since doing this, I, I made a, a sewing… book for all my needles, and the cover is all done in crazy patchwork and embroidery, and I did that on the train on my holidays this year down to, down to Provence. I wanted to add into it something to show… to represent Provence to me – nobody else would know, so I put in some sunflowers and some of the lavender in French knots. And while I was doing this, several people on the train actually stopped and asked if they could have a look at it, and that was nice that, yeah, sitting there just doodling away with embroidery and, and people were a-amazed to see it so that was that was nice. AD: So how did you start your journey in quilting? BD: I first got interested in quilting when I was about 16, which is a long, long time ago now. And in those days of course there was no internet and no YouTube so you couldn’t look anything up; if you wanted to look anything up you had to go to the library. And our local library didn’t have very much on, on quilting; I think the, the only thing I found was a book on English paper piecing. So I took that home and it was all about hexagons and you had to have very precise straight lines and very careful with your sewing. And as I have a lazy eye I’m not able to, to cut things straight, [laughs] everything was wobbly, and so I did start the, the English paper piecing and … I just found that my seams weren’t straight and that sort of thing. And now, of course, I realise that that actually didn’t matter because the seams are on the back so nobody sees it anyway. But this book was so precise you had to be so precise about your seams and everything, it did actually put me off and being 16, yeah, I was more interested in going clubbing, what you call now clubbing, disco in my day. So I… instead I, I went on to, to look at cross-stitch and I used to do a lot of cross-stitch. I don’t do any now because my eyesight’s not as good as it used to be, and I see the little holes are a little bit too small for me so I stopped doing cross-stitch in 2012. But when I was doing the cross-stitch I then, in my early twenties, just started sewing. I inherited my sister’s old Singer [noise] sewing machine and started sewing clothes because money was short and I really couldn’t afford to buy what I wanted so I started making my own clothes for work. And then when I got married I made my own wedding dress and my bridesmaid’s dress, and curtains and cushions, and when the children were small I made their clothes and dressing gowns and then it just went on to curtains and cushions for years. And I was still very interesting in, in patchwork and quilting, and when the children had flown I probably started then actually and it took my mind off the fact I had an empty house. And because I was putting bits in that belonged to their father and I, it was some… and you know they’re in it as well, their photos are in it, I just thought it was nice then that you know it could be passed on. So it’s been a long, a long process, but I finally got there [laughs] in the end. I finally completed a quilt and it didn’t matter that the seams weren’t straight, certainly not on crazy patchwork. The only thing they do have to be straight on, of course, is, is when you actually join your blocks. But you know you, even if, even if you make a mistake it doesn’t matter, because they’re happy accidents and you can always cover them up with a button or a bow or a bit of lace or, or something if you… Even when you’re doing, doing the, the crazy patchwork quilts, if you… you can always add in a bit of lace so you don’t have to embroider that seam, [laughs] if you’re getting a little bit sick of er [clears throat] doing any of the embroidery. AD: Does your quilt have a name then? Have you named it? BD: Yes, the, the name of my quilt is For The Love Of Old Lace, because there is so much lace in it and so much vintage lace, and all, as I say, all the, the last border is all vintage lace and vintage linen. The corners are made up from an old tablecloth, which I cut the, the corners, the four corners off. And then I had another… old tablecloth which had lovely corners, and so I decided to put those in the middle of each side, so they’re on [noise] all of the, the middle sides. But I just, I just loved the um, the look of them and I wanted to incorporate them into, into my quilt, which I think they, they fit quite nicely. AD: How… So how much time would you say that you have spent on your quiltmaking? BD: Well, I said earlier it took three years. I suppo… And that’s you know not doing it every night, that’s picking it up back, you could sort of not do anything for months. But if you added it all up together, and you did it every day and every evening I would say it would probably take about 18 months, purely because of the amount of embroidery that’s on it. If you didn’t, I mean you don’t have to do the embroidery when you do crazy patchwork by any means, in which case it would probably take [laughs] you about half that time. But I think it looks a lot nicer with the embroidery on it and if you ever look at a book that’s got crazy patchwork in it and you see one then that’s got embroidery on it, if you’re like me you’ll just fall in love with the embroidery and, and you’ll want to put that on, on your quilt. AD: Have you been to any workshops or quilting courses yourself where you’ve [noise] learnt to do some of the techniques? BD: No, e-everything… I’ve never been, I’ve never been on a sewing course. I’ve never been on a quilting course. [noise] It’s all from reading, watching various programmes and just trying it out myself to see how it, how it works and… if I like it I keep it. [laughs] If I don’t it goes… It doesn’t necessarily go in the bin. It could be cut up and put in something else. But no, I’ve nev-never been to… The only workshops I’ve ever been to are ones that I’ve taught, but no, I’ve never actually been to a, a sewing class or a workshop for patchwork or anything like that. 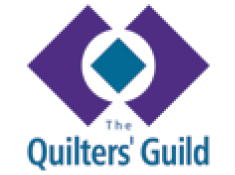 AD: Is there somebody’s work that you admire or are there different types of quilts? You, you say about the crazy patchwork. Is there someone else who does this, um that you’ve seen or…? BD: Yes, I mean lots of people do crazy patchwork. There are two, two people that I, I admire with their quilting. One is Sarah Payne and the other is a lady called Jenny Rayment. 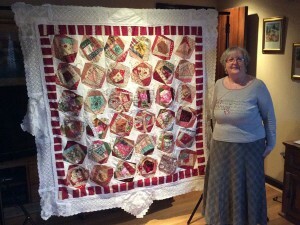 Jenny Rayment teaches quilting all over the world. She doesn’t just do patchwo… er crazy patchwork, she does all sorts of different types. And she, she is a, a what they call a fabric manipulator, so she will show you um different techniques that you can do with fabric that look absolutely amazing. And the way she… When you see them you think they look so complicated, but the way she explains how you do it, it, it is very easy. I haven’t actually tried any of her fabric um manipulation yet but I, I will do, because I think they, they really do look wonderful. And I wonder how they might look if you do them in crazy patchwork actually. That might be something to try and have a look at. The other lady, Sarah Payne, she is now also becoming a lot more known, both here and in, in the US. And she does… she has brought out some quilting kits for cushions that people can learn how to do quilting, because some people don’t want to go to a class or can’t go to a class for various reasons, and so a small project is not as daunting as saying, ‘Go and make a, a quilted quilt.’ So starting with a cushion is really a good idea. And so she brought out these kits and she showed various techniques as well, she teaches various workshops, one being the Disappearing Nine Patch, which is, is very, very clever. When you, when you see it you think, ‘Oh, gosh, I’m not gonna be cutting small pieces of fabric like that,’ but you don’t. It’s the way you, you join them and then you twist them and cut them and twist them again and it looks really, really clever. So I will try a couple of those techniques, but they, they are the two people that I can say, you know, have inspired, have inspired me. And I can’t remember which one of those two was actually demonstrating the crazy patchwork that I saw, so it was one of them that you can… I can blame for, for getting me involved in crazy patchwork. But I lo… I love crazy patchwork. I like other, other designs and styles as well, but crazy patchwork is my, my love. AD: What, in the future what do you see as your quiltmaking life in the future? BD: Mm. I will make a couple more quilts for my family, and then I think I’ll, I’ll probably leave it, because you can only make so many quilts and you’ve only got so much space. I might make one for the guest bedroom. 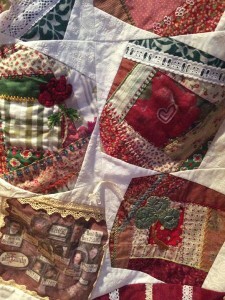 Oh there is, there is another lady as well; Mandy Shaw does some nice quilting. But I think smaller items that are quilted is what I’m going to perhaps concentrate more on… like I started doing these mug rugs which are like mini quilts, so I’m, I’m quite interested in those and do quite a bit of embroidery on that as well.. But I, I do, I do love going to these exhibitions and seeing what other people have done and, some of the ones that were at the festival were absolutely stunning, and I don’t think I could ever reach that level. There’s not enough years left [laughs] I don’t think, I think unless I was still quilting into my nineties or something. But yes I, I think, you know I, I still love quilting and I will make a couple more, but they won’t be in the same, the same design as this. AD: Are you part of any groups locally that sew or s… do craft creative things? BD: Yes I, I have been going, not on a regular basis, to a group that’s called Sew What that do various patchwork and quilting. I also go to a group called Rugging, Rugging Group, in Lostwithiel and also, although this group is called Woolly Wednesdays, it does all… the, the girls there also do sewing and I do sewing there. So although it’s called Woolly Wednesdays… It started off being mainly knitting and crocheting, but it’s grown so much that other people go that, that do sewing. And it’s nice to bounce ideas off of them and… that that’s really, really, really interesting. But those are the only groups I belong to. AD: Do you feel that… does that help you with your… your inspiration and your quiltmaking? What is it that you get from being part of these groups? BD: Mm, what do I get? Let me think. They’re, they’re just a great bunch of people and, as I say, you can, you can bounce ideas off of them. They perhaps don’t give me inspiration as such, more, it’s more sort of therapy when you go there because you, you, you laugh more than you do anything else. But it’s nice to see what other people create as well. And, and there’s you know some people there that do things that I could never, never do, and I admire them for, for what they do, and as I say I have been to a workshop, couple of workshops there. One was not so much a workshop it was more a demonstration which was lacemaking by Denise Watts, who’s quite famous for her lacemaking, and we had a go at lacemaking which was really good. I don’t know if I’d have the patience to sit and do that all the time. But, no, the, the groups are good because y… if you’ve done something that you’re not a hundred percent sure with, or you you’ve come up against something that you’re not sure how to do, there’s always someone there that knows how to do it. I mean a couple of people have said to me about the colour, colours that I use and putting them together. And I’m a bit mystified when they say I’m so good at putting colour together, because to me it’s just I’ll put a fabric against something and if I think it looks nice I’ll do it. And I’m surprised at the number of people that say they can’t do that, they, they don’t know which colours go with what, so I’m a… that sort of mystifies me a little bit because to me it’s just you put something together and maybe that’s just you know something that people have or they don’t have. But I, I just like… If, if I like a piece of fabric I’ll buy it. I may not necessarily know what I’m gonna do with it at the time, and then something will come into my head, ‘Oh I’ll use that bit of fabric,’ and that’s how it goes. But the, the groups I enjoy going to because they’ll say, ‘Oh!,’ whether they like something or they don’t, that that’s great because even when people give you a negative response on something you learn something from it, so that’s al-always helpful um ’cause everybody’s taste is not the same and it would be a terrible place if, if they all were so. AD: Do you have a, a special space in your house where you do your sewing? BD: I do, [laughs] but it’s overflowing at the moment and it’s got fabric on the floor and threads on the floor. Mm. It, it is a small space and I have started to take over the guest room as well with, with fabrics because I, I can’t resist a, a nice piece of fabric and I certainly can’t resist a lovely piece of lace. So my, my room is overflowing, the drawers are bursting to the seams, and now, as I say, the, the guest bedroom has started to see more than my fair share of fabrics. And also now I’ve got a new baby, a new sewing machine, and that hasn’t yet gone up into my sewing room, because I’ve already got two machines up there on the go, and I need to make some space for it so it’s actually on the dining room table so now I’m overflowing into the dining room as well! So I think probably need to move to a place where I’ve got a bigger workshop. Maybe the whole house [laughs]. That would be nice. AD: What would you give as the one thing that you can say has been the best thing about your quilting? BD: Oh, gosh, the best thing about my quilting? Mm. That future generations will be able to see the love that’s been put into it, that will have fabrics in it that both my husband and I have used and worn, that they can keep, that it’s something that they can pass on. I, I lost both my grandmas at a very early age. My sister had the benefit of my father’s mother who taught her to sew and to knit and to crocher… crochet, but unfortunately I never because she died before… well not before I was born but she died when I was very young. So it’s something that can be passed on to future generations and hopefully it might inspire them to get into quilting and sewing, because then they can put in part of their life into it, and I think it’s just something nice to to remember past generations by. Unfortunately, I haven’t got anything in the quilt that belonged to my mother. As I say she died many, many years ago, and apart from the shamrock, and I think it’s just nice to … to show that and, and to pass it on really so that they get inspiration from it too. AD: …for talking to us. Thank you.